All programs start with a 2-week language and cultural orientation. Courses include: art, design & media, communications, education, history, international business, international relations, political science, social science. In a competitive world, practical experience is an invaluable addition to classroom learning. Richmond’s Internship Program provides vital insights into a career field, experience in the global workplace, practical exposure to demands of specific jobs and development of professional and personal skills. Italy’s largest and most populated city, Rome is home to many international organizations, companies and humanitarian NGOs. All foreign countries have their embassies in Rome, some of them also have a second embassy to the Vatican. Three public universities, numerous private research institutes engaged in academic research and advanced technological services, culture and tourism industries, a network of marketing and communication enterprises operating to promote the incredibly rich cultural heritage of the city, offer plenty of opportunities for a successful internship in Rome. The Internship Program is designed to provide an integrated learning experience of a high academic standard, combining classroom study and an internship placement. International work experience offers students the opportunity to test their personal interests and abilities in a specific career field. An international internship also provides a valuable cultural perspective and the opportunity for interns to experience other approaches and viewpoints in the workplace. Students work and participate in specially designed seminars, tutorials focused on Italian business culture and cross-cultural management and review meetings for a total of 150 (3 credits) or 270 (6 credits) hours. The ideal internship placement is the successful combination between what an organization is seeking and the student’s skills. Internships are arranged by the Internship coordinator, after an assessment of his/her eligibility based on skills, interests and abilities in relation to what the organization needs. All academic aspects of the program are monitored and assessed by the Internship Coordinator and faculty advisors. Interns will be engaged in different fields ranging from traditional Italian small and medium enterprises (SMEs), international embassies, NGOs, to museums and cultural institutes, from humanitarian associations to fashion companies. Students may work in small or large organizations, located in different areas of the city; some working places may require good communication skills in Italian language. Students must attend interviews with suitable organizations; this is a competitive process. Final selection is always at the discretion of the organization and the Internship Program is not able to honor specific requests to join a particular organization or guarantee that students will be successful at interviewing. Credit is awarded after successful completion of all aspects of the program. To receive credit, students report to their supervisor regularly. In addition to working and attending the internship seminars and tutorials, they submit a weekly journal recording duties and learning as well as an analysis of specified aspects of the work experience. They must also submit a final internship portfolio describing and analyzing the workplace, the industry and goals achieved, including artefacts of work they have produced during the internship. Students give a presentation on their internship. Assessment is based on the above criteria. Grades of A to F, in accordance with the University grading policy, are assigned and recorded on Richmond transcript. The program consists of Italian language study (3 or 6 credits), internship seminars and 150-270 hours of unpaid internship (3 or 6 credits) plus one or two 3 credit additional courses among those offered in the semester and related to the internship field. Completed applications will be reviewed by the Admissions Committee and students will be notified of the admissions decision. The academic programs are designed in conjunction with Richmond, The American International University in London. The University is an independent, non-profit international university of liberal arts and professional studies with a student population of approximately 1,500. It is accredited by the Commission on Higher Education of the Middle States Association of Colleges and Schools. The Director of the program is appointed by Richmond and supervised by the Richmond administration in London. The Rome faculty credentials are reviewed and approved by Richmond University. The Richmond Study Center is located in a beautiful building in Piazza Sant’ Andrea della Valle in one of the richest areas of Rome’s historic center. 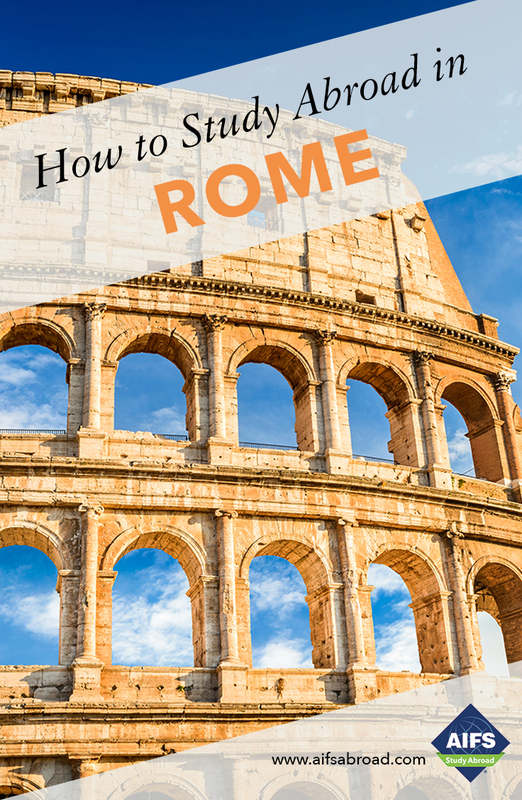 The Spanish Steps, Trevi Fountain, Colosseum, Pantheon, Piazza Navona, Roman Forum, Trastevere and the Vatican can be reached on foot in a few minutes. In addition to classrooms, the Richmond in Rome Center houses offices, a computer lab with Internet access and printing facilities, a reference library and two small student lounges. The library has a selection of 2,000 volumes in English related to Richmond courses, a film collection and periodicals available for student reference. AIFS - Richmond students have free admission to the extensive library collections available to them in Rome and access to the University web resources for e-books such as Dowsonera, Jstore and EBSCO. Wireless Internet is available for free to all students.